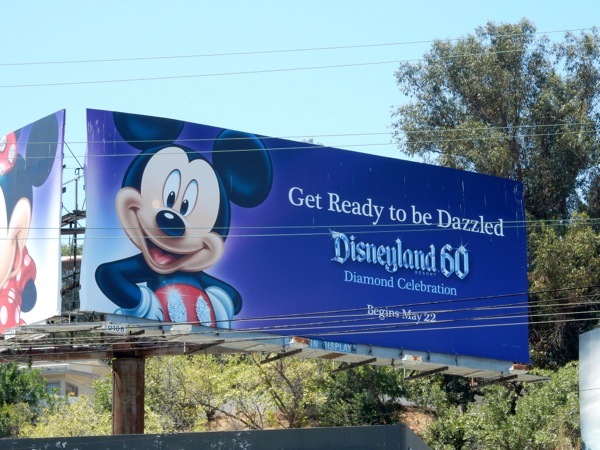 Fans of Disney will love today's special glittering billboards helping to celebrate the infamous California theme park's 60th Diamond anniversary. 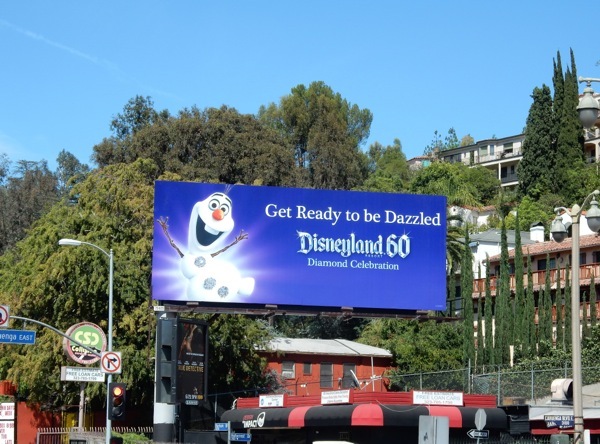 Get ready to be dazzled by the likes of 'Olaf the Snowman' from Frozen, 'Minnie' and 'Mickey Mouse', and even 'Mater' from the Cars animated movies. 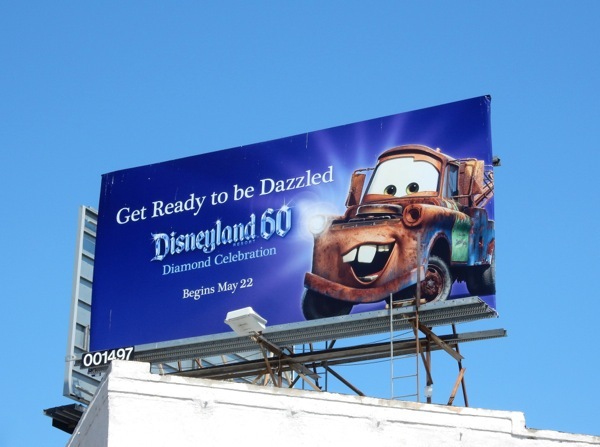 To help draw your attention to these anniversary ad creatives for Disneyland, some of these special billboards have been made even more eye-catching with glittering embellishments to fit the park's diamond-theme, be it the normally coal buttons on Olaf, the dots of Minnie's bow, or the buttons on Mickey's shorts. 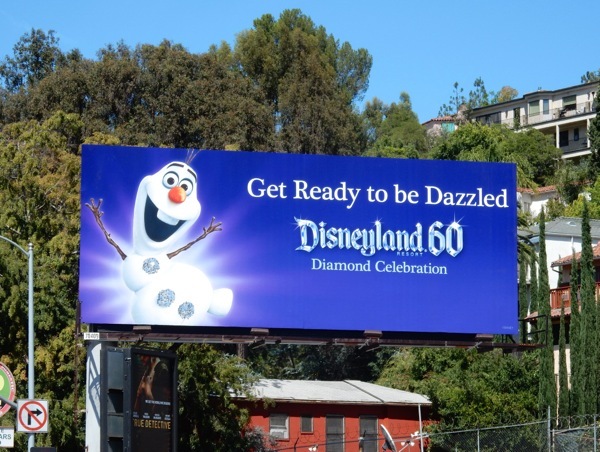 This duo of embellished billboards featuring sweethearts Minnie and Mickey, plus the glittering Olaf creative, can cleverly be found near the entrances and exit of the Universal Studios Hollywood, which is great placement to capture the attention of family audiences and theme park visitors. 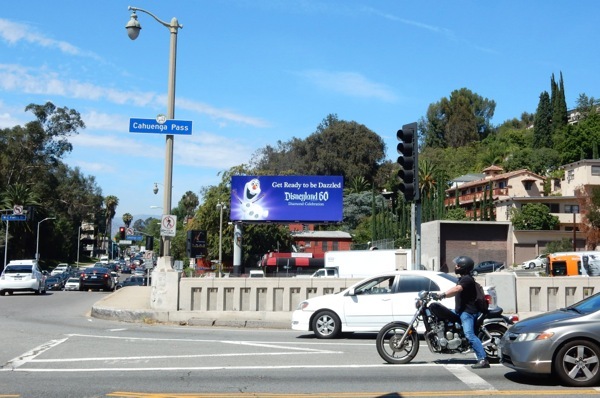 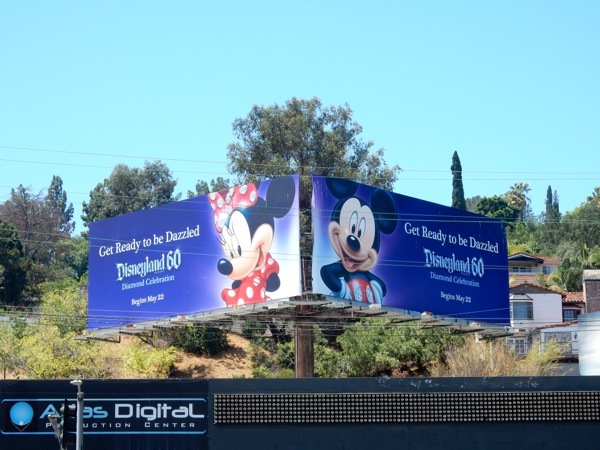 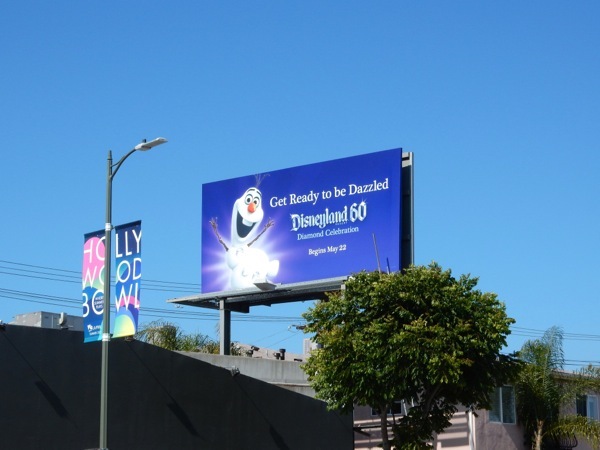 These glittering Disneyland 60 billboards were snapped on July 2 along Cahuenga Boulevard West at Universal Studios Boulevard, plus at the bottom of Barham Boulevard at Cahuenga Boulevard East respectively. 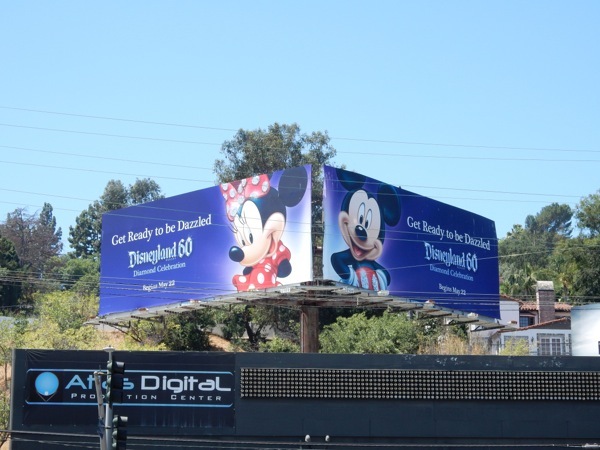 The other smaller standard ad creatives were spied around the streets of L.A., from La Cienega Boulevard to Pico Boulevard and Sunset Boulevard, from June 2 to July 5, 2015. 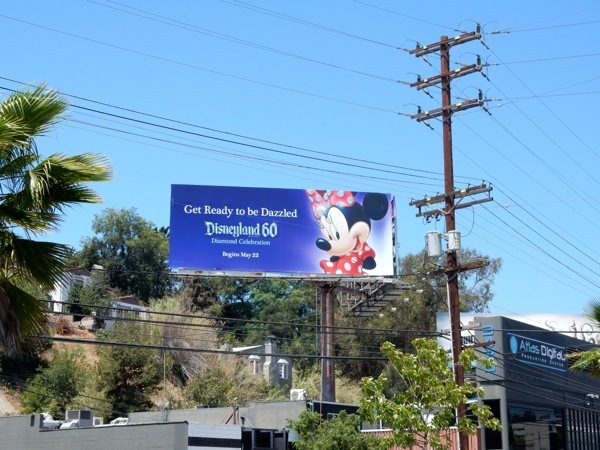 If you're a fan of Disney's original amusement park in Anaheim, California, which opened its doors in July 1955, be sure to also enjoy these other Disneyland advertising billboards, featuring many of your favorite Disney characters and also themed for Halloween and the Holidays. 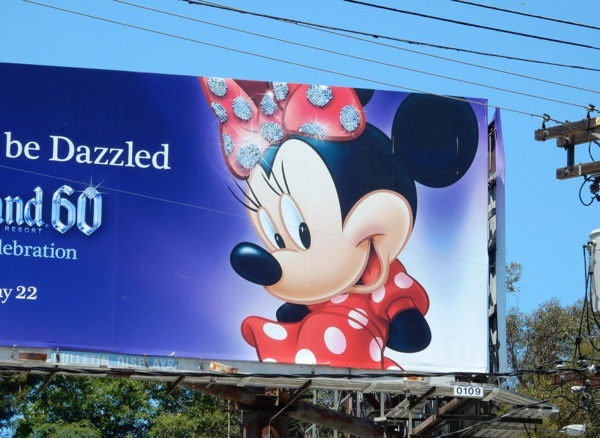 If you like these special dazzling billboards, you'll probably also like this glittering lips billboard for the American Music Awards and these GCB TV series billboards, which both feature similar attention-grabbing treatments. 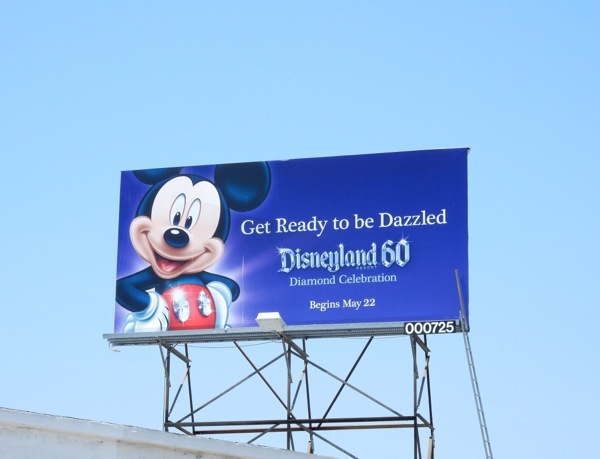 Will you be visiting Disneyland this Summer to help commemorate 60 magical years of being the happiest place on Earth?